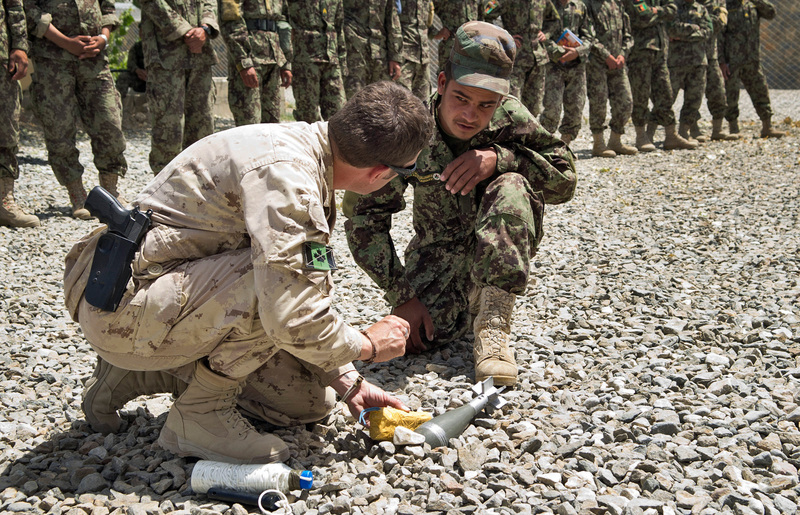 Lessons from a Decade in Afghanistan, by Nipa Banerjee, visiting professor at the University of Ottawa Graduate School of Public and International Affairs and Senior Advisor at the Rideau Institute, was originally posted on the Centre for International Policy Studies (CIPS) blog. It is reproduced in its entirety below. The lessons below are gleaned from the experiences of the international community in the decade following the overthrow of the Taliban regime. They provide partial answers to the question of why Afghanistan has faced renewed conflict and a resurgent Taliban, both detrimental to security and development. The limited success of the mission in Afghanistan is rooted not in the strength of the Taliban, but in the weakness of the international community’s counterinsurgency operations, including development and security programming that missed the mark. Lesson 1: Any sustainable war effort requires domestic public support to justify the expense and the sacrifice of lives. Continued domestic support demands both transparent explanation of the objectives of the war and transparent reporting on the results of security and development investments. Lack of communication with the public pervaded Canada’s Afghan mission, with a resulting deterioration of domestic good will and support. Lesson 2: Preventing a recurrence of conflict must be accepted as the first priority. There was simply no strategy to address the question “after war, what?” for prevention of conflict and a Taliban resurgence. The quick victory created euphoria and over-optimism, which generated a certain smugness and complacency in the international community. The Taliban took advantage of the negligence of the external powers and commenced resurgence in the areas where they still had support. Lesson 3: Look at the complexities of the situation before leaping into longer-term commitments. Ground research was necessary to support the involvement of Canada and other international partners in a country where most of them were strangers. Sound analyses of the history and causes of conflicts, military and political zones of influence, the existing risks, and the interests of all conflicting parties, actors, and stakeholders were of utmost importance. Few members of the international community undertook such assessments. There was thus no strategy guiding the comprehensive whole-of-government approach involving defense, diplomacy, and development. Lesson 4: When working in complex situations, background knowledge and proper training of staff are absolute necessities. Expatriate staff representing their respective governments in Afghanistan were often not experienced and, most of the time, not trained in handling conflict-sensitive issues. Quick rotation of expatriate staff in and out of the country did not allow them to learn the ropes, establish credible networks, and implement plans relevant to complex situations. Lesson 5: Two pre-requisites of an effective civilian operation in a fragile state are proximity to the local population and extensive networking. Attention to these factors promotes understanding of the country, its people and culture, and thus their needs and priorities, which are the basis of needs-based planning, programming, implementation, and monitoring. These factors also help earn protection for and ensure the safety of expatriate staff. The contrary practice, adopted by the international community, of staying locked down in compounds for extended periods resulted in loss of contact with the local population and thus plans and actions disconnected with their realities. This had the predictable consequence of generating resentment among the Afghan people and neutralizing the effectiveness of field offices and international staff. Lesson 6: Ensuring that opposition groups have a stake in the post-conflict order must be a priority. Failure to placate those on the losing side immediately following the cessation of conflict often paves the way for its re-occurrence. Missing the opportunity to leverage the weakness of the enemy immediately after its defeat hobbles longer-term strategic gains. In 2001, the defeated Taliban was in a weakened position and would have been more pliable in accepting proposals set forth by the winning party. It was a mistake to reject any attempt at reconciliation at the time. Now the dire need for reconciliation allows the Taliban to negotiate from a position of strength and makes it harder to secure a just settlement that will not be detrimental to the Afghan population. Lesson 7: Weak state institutions breed instability. When the state governance is incapable of delivering services, including law and order, it feeds conflict by allowing insurgents to win the support of a frustrated public. No coordinated strategy for strengthening public institutions was ever developed by the international community for establishing the legitimacy of the new Afghan state. Poor technical assistance left government institutions weak and expatriate consultants rich. Beginning training of the Afghan national security force only after the insurgency had already strengthened dramatically is but one instance of the international community’s negligence in prioritizing essential institutional capacity-building needs. Lesson 8: Promoting the profile of the international community at the expense of establishing the authority of the local government undermines peace building and stabilization efforts. Canada sought to raise its own profile in Kandahar through the signature projects of the Provincial Reconstruction Teams (PRTs) instead of helping the Afghan government earn the support and loyalty of its own people. This parallel set of priorities undermined the Afghan government’s efforts to gain a presence in the provinces and generate popular support. Lesson 9: Achieving synergy and coordination of the international community’s support is the key to success. The different military and civilian agencies from different donor countries approached their tasks with different goals, methodologies, and timelines and were often unaware of one another’s efforts, negating the conditions necessary for coordinated development and reform. Lesson 10: Establishing clear results with indicators and accountability structures are essential to getting a difficult mission on track. The international community and the Afghan government flitted relentlessly from one conference to the next, with both parties making commitments, most of which remained unmet. No attempts were made to create an action plan, monitor progress, or integrate any lessons learned into forward planning. Fallen dead on the roadside were the Afghanistan Compact, security sector reforms, and an overall national development strategy. The Aid Effectiveness principles endorsed by donors in 2005 were simply trashed. These ten simple lessons outline the early warning signs of the failure of peacebuilding that were ignored along the way. As the international community continues to trudge along in its second decade in Afghanistan, is it too late for them to learn the basics that they should have learned a decade ago? A longer version of this article appears in Australia and Canada in Afghanistan: Perspectives on a Mission, edited by Jack Cunningham and William Maley (Toronto: Dundurn Press, 2015).